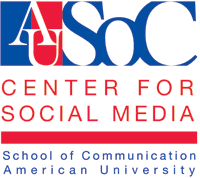 A couple of great items to share from the Center for Social Medial. Second, if you're an educator who encourages the remixing of social media for student generated video content, I'm sure you grapple with issues of copyright and the appropriate way to communicate "fair use." Well, take some time to check out the enlightening Fair Use Teaching Tools shared by the Center for Social Media including: Teaching About Copyright and Fair Use for Media Literacy Education, Fair Use Language for Course Syllabi, Copyright Backgrounder, and Fair Use Scenarios. Another great site for ideas on teaching copyright is: http://www.teachingcopyright.org/ by the Electronic Frontier Foundation. You Tube also has many interesting discussions on Fair Use and copyright.